What is genetic counselling and how can it be useful? When might I see a Genetic Counsellor? What happens in a Genetic Counselling appointment? Every pregnancy has a risk of having an abnormality, either from inherited or non-inherited (sporadic) problems. Genetic counselling is the technique of providing expectant mothers with information about this risk and discussing tests available to detect potential problems. Genetic counselling aims to facilitate informed decision making for patients. Patients may find it useful to discuss with a Genetic Counsellor the pros and cons of the wide range of screening and diagnostic tests before deciding if these tests are appropriate for their circumstances. A Genetic Counsellor can be an invaluable source to provide information and aid patients in the decision making process for tests such as Chorionic Villus Sampling (CVS), amniocentesis, nuchal translucency, maternal serum screening, the VCGS Reproductive Genetic Carrier Screening test, and non-invasive prenatal testing/screening (NIPT/NIPS) for Down syndrome. There are a variety of different situations where a Genetic Counsellor may be involved in your care. Genetic Counsellors are experienced in dealing with unexpected situations during pregnancy, such as an increased risk result on a Down syndrome screening test, or a diagnosis of a fetal abnormality on ultrasound. Some patients may meet with our Genetic Counsellor immediately after their ultrasound to discuss the findings of that ultrasound and next steps available including further investigations and support. Other patients may book an appointment in advance with our Genetic Counsellor. This may be to discuss results already available, for example from a Down syndrome screening test or genetic carrier screening test; or to discuss alternatives for screening and diagnostic testing options during a pregnancy. Referring doctors may wish to speak to our Genetic Counsellor about a patient or test result before deciding whether a genetic counselling appointment would be of value. We will liaise closely with our referring doctors to keep them fully involved in these discussions. Our Genetic Counsellor will first discuss with you the reason for the appointment, including your main questions and concerns. The Genetic Counsellor will then discuss all the relevant information, including past or family history, options for obtaining further information, and answer questions you may have about your situation. The Genetic Counsellor will provide the necessary information to support you in making an informed decision about any further testing, ensuring that you understand the risks and benefits before proceeding with screening tests or a diagnostic test such as CVS or amniocentesis. Our Genetic Counsellor can provide information about the variety of different tests available during pregnancy to detect an abnormality in your baby. These tests are categorised into screening tests and diagnostic tests. A screening test is designed to assess the likelihood of your baby being affected by a particular condition, for example Down syndrome. The screening result is often expressed as a risk ratio (for example, 1 in 100); this means there is 1 chance in 100 that the pregnancy has a problem. A diagnostic test is designed to give a definite diagnosis (a yes or no answer), rather than a risk or likelihood. 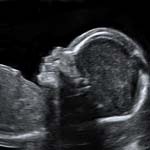 Ultrasound is used as both a screening test and a diagnostic test. 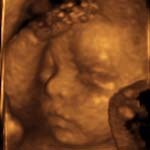 At the routine anatomy ultrasound around 19-20 weeks of pregnancy, your ultrasound doctor will be examining your baby for structural problems as well as soft markers. 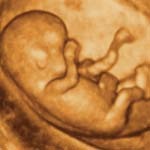 Ultrasound findings of ‘soft markers’ may indicate an increased risk of Down syndrome. Examples of soft markers include nuchal translucency/nuchal fold, absent (uncalcified) or short (hypoplastic) nasal bone, and echogenic bowel (where an area in the bowel looks brighter than it should on ultrasound). These soft markers may indicate an underlying chromosomal or genetic problem with your baby. The most common Down syndrome screening test is the Combined First Trimester Screening test. This test gives a risk assessment for Down syndrome in a pregnancy using a combination of hormones measured in the mother’s blood (the blood sample is best taken at 10 weeks) and ultrasound (ideally at 12 weeks) measuring the nuchal translucency, the fluid at the back of the baby’s neck, and calcification of the nasal bone. This test has several advantages; the fetus is looked at in detail, a large number of abnormalities can be detected at this early stage, and the pregnancy due date can be confirmed. A risk for Down syndrome is calculated by Victorian Clinical Genetics Service (VCGS), based at the Royal Children’s Hospital. This test has a detection rate of approximately 90% of cases of Down syndrome. Patients who receive an increased risk result on this screening test will be offered further diagnostic testing (CVS or amniocentesis). 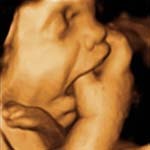 For further information please see Combined First Trimester Screening. A technique for Down syndrome screening is now available, called non-invasive prenatal testing (NIPT) or non-invasive prenatal screening (NIPS), which measures the relative levels of free circulating fetal DNA in the mother’s blood. This type of testing has a higher detection rate for Trisomy 21 than the Combined First Trimester Screen (detection rate of approximately 99%). 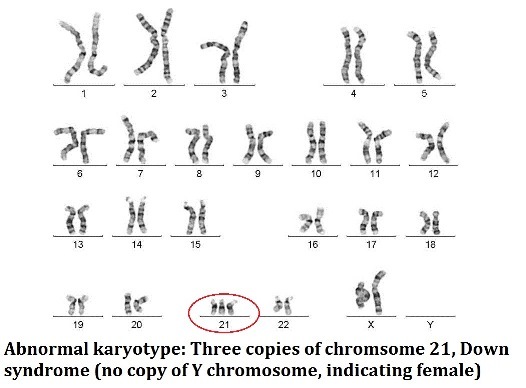 It however has limitations in that it does not detect all cases of Trisomy 21, and this technique of testing only looks at a few specific chromosomes (21, 18, 13, and in some cases, X and Y chromosomes). If a pregnancy has a chromosome abnormality other than Trisomy 21, 18 or 13, then this abnormality will be missed by the NIPT test. 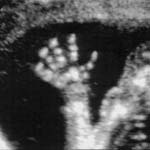 Other chromosome abnormalities may be suspected on a first trimester or second trimester ultrasound, and would certainly be detected on a CVS or amniocentesis. For further information please see non-invasive prenatal testing. VCGS have developed a screening test, the VCGS Reproductive Genetic Carrier Screening test, aimed to detect carriers of three common genetic conditions, Cystic Fibrosis (CF), Fragile X syndrome (FXS) and Spinal Muscular Atrophy (SMA). Parents may be healthy carriers of one of these conditions, and have a chance of having a baby born with CF, FXS or SMA. This test is performed as a blood test, and results are available within approximately 2 weeks. 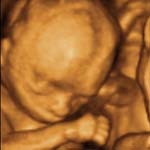 As discussed above, ultrasound is used as both a screening and diagnostic test. It can be used to diagnose structural problems with a baby’s development, such as heart, lung, limb, brain or spinal abnormalities. 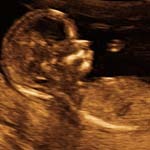 Sometimes your doctor may request an early anatomy ultrasound, at which stage many structural problems may be detected. The optimal times for an ultrasound to check the anatomy of your baby is 12-13 weeks for large defects and 19-21 weeks for smaller abnormalities. Chorionic Villus Sampling (CVS) and amniocentesis are both invasive tests which involve sampling the placenta (CVS) or amniotic fluid (amniocentesis). Patients may have a CVS or amniocentesis for a variety of reasons, including: increased risk for Down syndrome, fetal abnormality diagnosed on ultrasound, or being carriers of a genetic condition. CVS is performed at approximately 12-13 weeks, where amniocentesis is performed from 15 weeks onwards. Both tests carry a small risk of miscarriage. There is more than one way to analyse a sample from CVS and amniocentesis. 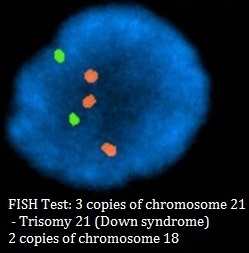 The FISH test (Fluorescent in-situ hybridisation) tests for the 5 most common chromosome abnormalities; how many copies of chromosomes 13, 18, 21, X and Y. In particular, this result will detect Down syndrome. This result is generally available on the next business day after the test. 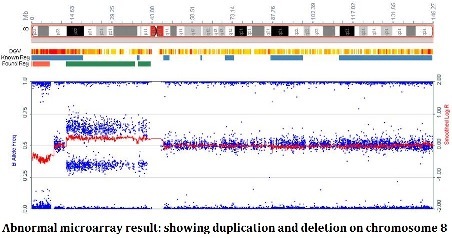 The full chromosome result is available either as a conventional karyotype (visually looking at the chromosomes under a microscope) or molecular karyotype, also known as a chromosomal microarray (a more detailed molecular assessment of the chromosomes, able to detect smaller copy number variations, where there is an imbalance in the amount of chromosome material compared to what is expected). The full chromosome results are available approximately 2 weeks following the test. For further information please see CVS and amniocentesis. Our Genetic Counsellor works closely with Dr Bethune and our other ultrasound specialists to ensure that you have the opportunity to discuss all the relevant information about your current situation. Many genetic counselling patients will also require specialist medical advice from obstetric, genetic or cardiac experts. Our Genetic Counsellor will coordinate and liaise closely with these specialists. Genetic counselling is available either in person or via the telephone. For further information please phone the practice and ask to speak to our Genetic Counsellor. While it is not essential, it is preferred to receive a referral from your doctor for a genetic counselling appointment. This assists us in communicating relevant information to your doctor. Our Genetic Counsellors can be contacted by phoning the practice on 03 9898 9055 or by email at genetics@swus.com.au.